What did President Ronald Reagan think of Rocky IV? How did the Matthew Broderick film WarGames inform America's missile defense system? What Michael J. Fox movie made such an impression on President Reagan that he felt compelled to mention it in a speech to the Joint Session of Congress? Over the course of eight years, Mark Weinberg travelled to Camp David each weekend with Ronald and Nancy Reagan. 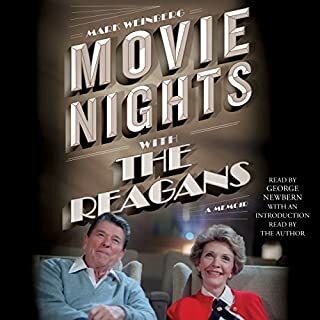 Longtime Reagan aide Mark Weinberg takes weekend movie nights at Camp David and uses them to illustrate some of his recollections of the Reagan years in the White House. The recent release Inside Camp David offers a first glimpse at President and Mrs. Reagan's nightly movie screenings at Camp David and the Reagan Library has a full list of the 300+ movies they watched while in office. Reagan invited Camp David personnel, aides and others in to watch a film on Friday and Saturday evenings at the Camp. After the film the President would discuss the finer points of it (and moviemaking) with those in attendance. Each film or handful of films mentioned in the book reflect a chapter and are used to relate them to larger segments of the President's policies or an anecdote (or both). It's an interesting read with some great recollections from one of the only members of the Reagan staff to serve all 8 years (and the first few years of the post-Presidency).